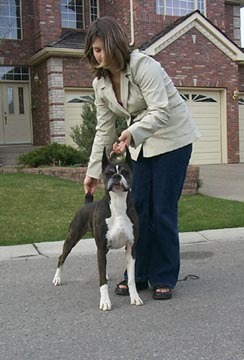 We would just like to say that THIS is what a 7 year old Boxer should look like!! She blended substance with elegance. She posesses a nice topline, good bite, good head and an attitude that has kept her going in the ring for 7 years. I received Magic for my 10th birthday. I was ecstatic, I had wanted my own show dog since I was 7 and she was exactly what I dreamed of when I told my mother I wanted a black puppy named Magic. By the time she was a year old Magic had surpassed all the dreams and expectations we had for her. 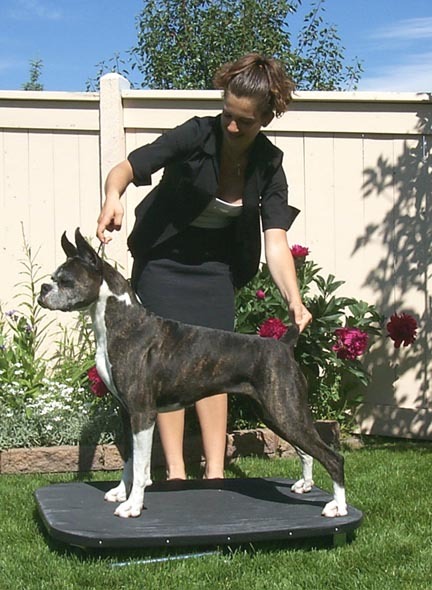 When she was 6 1/2 months old we decided to send her with her kennelmate (Java) to a dogshow in Regina. Weren't we surprised when this little black puppy came home a champion, with the BOW and BOS awards for all 3 days, not to mention bringing home ribbons for 3 BPIG and a BPIS. This was just the beginning of her awesome career. In her short ,but great, show career Magic went on in tough Canadian and American competition to place in the group many times and win over 15 BOB's. We stopped showing Magic before she was 2. By then she had 3 BPIS, 8 BPIG, 4 Group 4 and 2 Group 2's. She also has 10 pts. (2 majors) in the States. Magic is a daughter of Am./Cnd.Ch. Turo's Kristen Dior. Although she never had a litter, Magic has been the Auntie of every Hi Times puppy ever produced. Now almost at the age of 7 we are preparing to bring her out as a veteran. 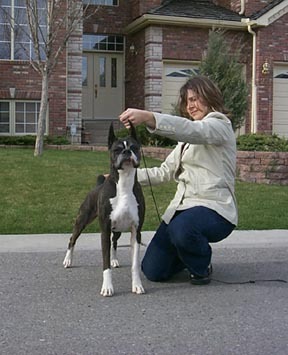 Along with being a show dog Magic went on to be my first Junior Handling and agility dog. In our first year of junior handling Magic and I made it all the way to the Alberta Junior Handling, Senior Open Finals. 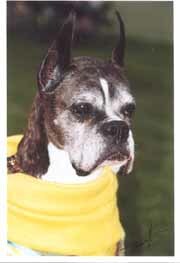 She develped DM at 9 years of age and sadly had to help her to the Rainbow Bridge, a year later. We will miss her "ole battle axe" reputation. She kept everybody in line with a the "alien face". She was a joy to live with.